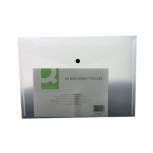 Q-Connect Polypropylene Document Folder A4 Clear (Pack of 12) KF01244Q Pack of 12 Document folders with press-stud fastener. Wallet design with flap. Made from tough translucent polypropylene. Keeps documents secure and protected from damage. Capacity up to 150 sheets. 23.6cm x 33.4cm. 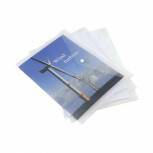 Pack of 12 clear folders. 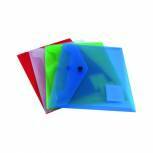 Q-Connect Polypropylene Document Folder A4 Assorted (Pack of 12) KF03599 Pack of 1 Q-Connect Document Folders. Manufactured from hard wearing transparent polypropylene with a press-stud closing mechanism keeping contents secure. Suitable for A4 papers. Colour - Assorted. 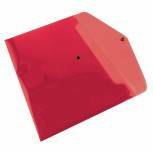 Q-Connect Polypropylene Document Folder A4 Red (Pack of 12) KF03594 Pack of 12 Q-Connect Document Folders. Manufactured from hard wearing transparent polypropylene with a press-stud closing mechanism keeping contents secure. Suitable for A4 papers. Colour - Red. 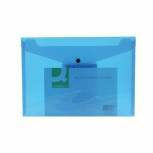 Q-Connect Polypropylene Document Folder A4 Blue (Pack of 12) KF03596 Pack of 12 Q-Connect Document Folders. Manufactured from hard wearing transparent polypropylene with a press-stud closing mechanism keeping contents secure. Suitable for A4 papers. Colour - Blue. 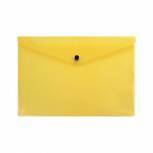 Q-Connect Polypropylene Document Folder A4 Yellow (Pack of 12) KF03595 Pack of 12 Q-Connect Document Folders. Manufactured from hard wearing transparent polypropylene with a press-stud closing mechanism keeping contents secure. Suitable for A4 papers. Colour - Yellow. 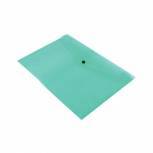 Q-Connect Polypropylene Document Folder A4 Green (Pack of 12) KF03597 Pack of 12 Q-Connect Document Folders. Manufactured from hard wearing transparent polypropylene with a press-stud closing mechanism keeping contents secure. Suitable for A4 papers. Colour - Green. 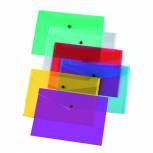 Q-Connect Polypropylene Document Folder A5 Assorted (Pack of 12) KF03609 Pack of 1 Q-Connect Document Folders. Manufactured from hard wearing transparent polypropylene with a press-stud closing mechanism keeping contents secure. Suitable for A5 papers. Colour - Assorted. 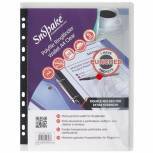 Snopake Polyfile Classic Foolscap Clear (Pack of 5) 11154X Pack of 5 Snopake Polyfile. Durable polypropylene file with an attractive see-through superline finish and press-stud closure. Foolscap Clear. Pack of 5. Snopake Polyfile Ring Binder Wallet A4 Clear (Pack of 5) 12566 Pack of 5 Smart durable and polypropylene file with landscape press-stud closure. 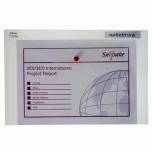 Multi-punched to suit most ring binders and lever arch files. Ideal for filing and protecting unpunched documents. Holds 35 sheets of 80gsm paper. Clear. Pack of 5. 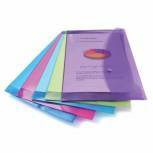 Rapesco Popper Wallet Foolscap Assorted (Pack of 5) 0688 Pack of 1 Durable Superline translucent coloured polypropylene file with foldover flap. Colour co-ordinated press-stud closure to keep contents safe and secure and handy pen holder cut-out under the curved flap. Assorted Bright Colours. Size - Foolscap. 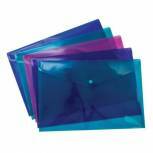 Rapesco Popper Wallet A5 Assorted (Pack of 5) 0689 Pack of 1 Durable Superline translucent coloured polypropylene file with foldover flap. Colour co-ordinated press-stud closure to keep contents safe and secure and handy pen holder cut-out under the curved flap. Assorted Bright Colours. Size - A5. 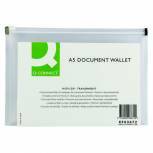 Q-Connect Document Zip Wallet A5 Transparent (Pack of 10) KF03672 Pack of 10 Q-Connect Zip Wallets. 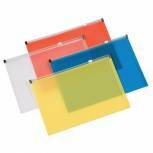 Lightweight transparent document wallets with plastic closure. Ideal for hundred of uses in office industry home and school. Size - A5 (250x180mm). Colour - Transparent. 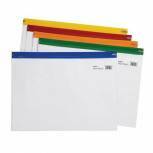 Snopake Polyfile Electra Foolscap Plus Assorted (Pack of 5) 10088 Pack of 1 Snopake Polyfile Foolscap Plus. Durable polypropylene files with a press-stud closure to keep the contents safe and secure. Stunning Electra colours. Pack of 5. Rapesco ECO Popper Wallet A4 Plus Clear (Pack of 5) 1040 Pack of 5 Rapesco ECO Popper Wallet A4 Clear Pack of 5 1040. 100 recyclable and biodegradable polypropylene. Holds up to 50 sheets of A4 80gsm paper. Secure press stud closure. Convenient pen holder. 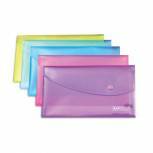 Snopake Zippa-Bag S Classic A5 Assorted (Pack of 25) 12722 Pack of 1 Snopake S-Type Zippa-Bag. Transparent, flexible bags with a tough plastic closure and metal zip pull. Ideal for hundreds of uses in the office, home, school and industry. Supplied with five different colour zip strips for easy identification. A5. 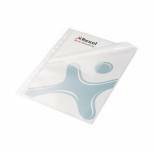 Rexel Anti Slip Pocket with Flap Polypropylene A4 (Pack of 10) 2102383 Pack of 1 Rexel Anti-Slip Pockets. Premium quality A4 pockets manufactured from anti-slip polypropylene with top and side opening for easy access to contents. The three quarter weld on the right to keep contents secure. 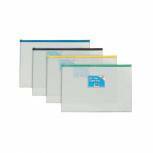 Snopake Polyfile Ring Binder Wallet A4 Electra Clear Assorted (Pack of 5) 15695 Pack of 1 Each wallet holds 100 sheets of 80gsm paper. Allows unpunched documents to be safely stored in ring binders. Reinforced edge for durability. Gussets on 3 sides for expandability. Secure popper closure to keep papers safe. Assorted colours. 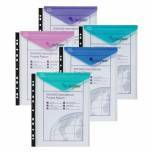 Q-Connect Document Zip Wallet A5 Assorted (Pack of 20) KF16553 Pack of 20 Coloured, lightweight document wallets with zip. Made from polypropylene. Keeps documents safe and dry. Ideal for filing and transporting documents and presentations. Assorted pack contains 5 each of red, clear, blue and yellow. Size: A5. Snopake Zippa Bag S Classic A4-Plus Assorted (Pack of 25) 12814 Pack of 1 Snopake S-Type Zippa-Bag. Transparent, flexible bags with a tough plastic closure and metal zip pull. Ideal for hundreds of uses in the office, home, school and industry. Assorted colour zip strips for easy identification. A4 Plus. Pack of 25.